I’m bit late writing this. It is now beyond the middle of January and I still haven’t posted my new year resolutions / plans for the rest of the year. Perhaps one of them should be getting myself organised. The TBR challenge – I’m excited about this challenge for a nu mber of reasons. First of all, it is always exciting to be forced to read books you’ve been meaning to read for ages. One of the books I am reading for this (Death Comes to the Archbishop) has been on my shelf for twenty years. This really is ridiculous. If not for this challenge then I probably would never have picked it up. It becomes far too easy to ignore these books in favour of new and more exciting books. The other reason that this challenge is good is that it does not involve my kindle. It is all books from my shelf. It doesn’t involve buying new books either. This can only be a good thing. 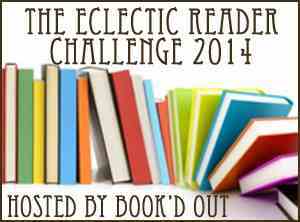 The Eclectic Reader Challenge 2014 – I’m looking forward to th is challenge for different reasons. I really enjoyed the way it took me out of my reading rut. This year there are even more genres that I don’t usually read so that should be interesting. In terms of writing, I have a few things I want to do. In terms of reviewing, I am going to try to write a review for every book I read this year, regardless of whether it is for a challenge or not. I have a few final tweaks to Choose Yr Future and then I will be looking for beta readers and hopefully be looking towards publication this year. I am going to try and use writing prompts to write more short fiction and also make more efforts to get what I have written published / entered in more competitions. Finish my current project which hasn’t got a name yet but is about 60000 words long. So an exciting year hopefully. Certainly a busy one with lots of challenges and lots of fun and hard work ahead.